Aruba is a tiny Dutch Caribbean Island located 20km off the coast of Venezuela. The total area of the island covers 193km2 with has a coastline of 68.5km. The total population of the island is approximately 100,000 people. Aruba consists of a core of ancient rocks that formed more than a hundred million years ago. The rock formations characterize the interior of the island. The Northern coast of the island is rocky and formed by coral plateaus with sandy bays called Bocas. Due to the northeast trade winds, the water is constantly crashing against this rocky coast. The south and western side of the island are lined with kilometers of endless beaches, which are some of the finest in the world, as well as other major tourist attractions. This Dutch island consists of vegetation and topography which is unique to this specific area in the Caribbean. Due to the depth of visibility in the water (approximately 30 meters or 100 feet) and the beautiful coral reefs, the ocean surrounding this island is a popular destination for divers and snorkelers. Oranjestad is the capital of Aruba and is located on the southern coast. It is characterized by colorful buildings, shopping centers, restaurants, a Casino, and other nightlife attractions. There is no doubt that you will find the experience you are looking for during your visit to Aruba. 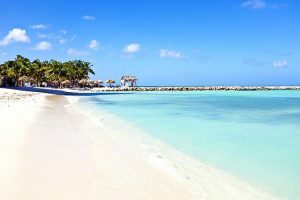 Aruba is a safe island compared to other Caribbean islands. You are able to experience the interior of the island without concern. For your valuables our house has a safe as well as a secure alarm system to ensure a worry free stay. Aruba is part of the Leeward Islands and is not generally susceptible to Hurricanes or other natural disasters. The climate and ecosystem are distinct from other islands in the area, characterized by cactus plants, Divi Divi trees, aloe plants, as well as a diverse wildlife. Aruba has many species of birds, lizards, iguanas, pelicans and lots of sea creatures that live among the coral reefs. Aruba’s culinary traditions are inspired by the presence of the sea. The traditional Aruban dishes are almost all fish dishes, such as: Scavechi: marinated fish entree, Marisco: seafood appetizer, Giamba: Caribbean bouillabaisse, main Balon pisca: fish balls. There is a wide variety of specialties ranging from local cuisine to international cuisine. There are many grocery stores on the island, including the SuperFood which satisfies all of your shopping needs and is within 10 minutes of the Villa. Aruba has a tropical and extremely sunny climate. The trade winds provide a nice breeze and refreshing coolness both day and night. Therefore, warm clothing is not often necessary. Aruba is not generally affected by tropical storms. The coolest month is January with an average temperature of 27.5C/81.5F. The hottest months are August, September and October with an average temperature of 30C/86F. The average temperature throughout the year is 28C/82.4F. There is no rainy season in Aruba; however, when it does rain it is in the form of short heavy showers. A journey to the island can be enjoyed at all times of year due to this consistently delightful weather. The peak season runs from mid-December to March and in these months it is slightly busier on the island. The official language in Aruba is Dutch but many of the locals speak English and Spanish. The name of the native language to the island is Papiamento which is a mixture of Dutch, Spanish, English, French, Portuguese and some African dialects. The local unit of currency in Aruba is the Aruban florin. American Dollars are also widely accepted. Money can be exchanged at various banks and ATMs on the island and a currency exchange is also available at the airport. Banks are generally open Monday to Friday from 8AM to 12PM and from 1:30PM to 4PM. Prior to your travels, please ensure that your debit card is able to be used outside of your home country if this is your preferred method of payment. Major Credit Cards, including American Express, Visa, Eurocard/Mastercard, and Diners Club are accepted in most hotels, shops, and restaurants. It is also possible to utilize your credit card to withdraw money; however, some extra charges may apply. No vaccinations are required to visit the island. Please consult with your health practitioner prior to travelling to Aruba if you have visited an area where yellow fever is present. The tap water in Aruba is safe for drinking; therefore it is not necessary to purchase bottled water for consumption. North American cell phones will work in Aruba, however, please keep in mind that if you retain your own sim card you may incur roaming fees from your cell phone provider. You should see if they offer coverage in Aruba and what it would cost. Consider renting or buying a cell phone or sim card to use with your own cell phone if your phone company does not offer coverage in Aruba. Please also keep in mind that the voltage in Aruba can be as high as 127 volts so you need to make sure your charger can handle this voltage. In and around our villa you can use Wi-Fi to Skype or make phone calls. 110/120 V. North American style outlets are utilized in the Villa and are the most popular style of outlet on the island. European adapters are provided. Be cautious when using taxis and always ask in advance what the costs are for these services. The bus services are listed in the telephone directory/yellow pages. Bus transportation is inexpensive but may not be very practical for your vacation. Grocery stores can be found within close proximity of the Villa. These stores and usually open until 9PM Monday-Saturday and 2PM on Sundays. In Aruba there are several Car rental companies, which allow you to enjoy your vacation to the fullest as some areas of the island are not accessible without a vehicle. The following websites provide reasonable pricing for Car rentals: www.hotwheelscarrental.com and www.amigocar.com.